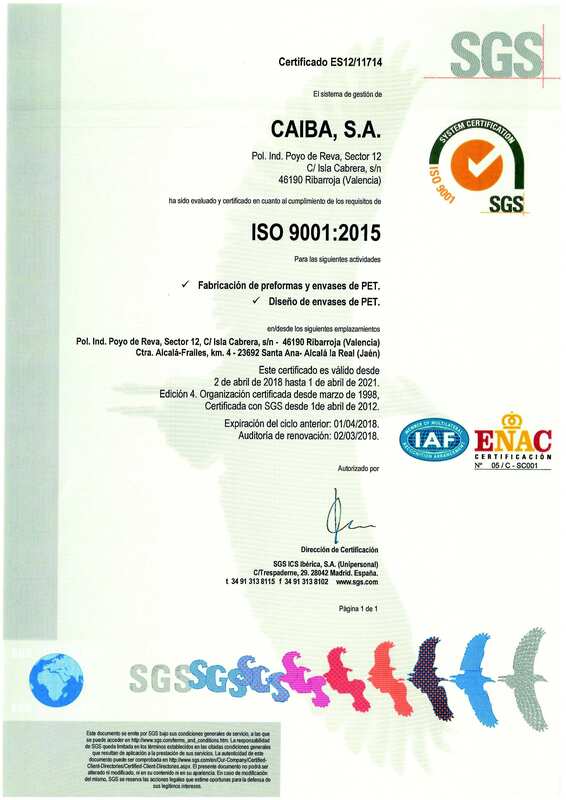 At Caiba we manufacture our products in line with the most stringent quality controls and only use materials that comply with the current legislation, which has led us to have been granted the ISO 9001:2015 certification. Our preforms and containers are also certified with the BRC Issue 5 Global Standard for Food Safety, a reference framework which guarantees the safety, legality and quality of the containers and the material used for their manufacture, an essential requirements for the food, cosmetic and pharmaceutical industry. Likewise, and to guarantee the safety and hygiene of the product we manufacture, we provide a HACCP system that identifies, evaluates and prevents the physical, chemical and biological product contamination risks, throughout all the processes of the supply chain. This enables establishing the appropriate preventive and corrective measures to ensure the safety of all our containers. All of this guarantees that our containers and preforms comply with all the technical specifications and that they maintain the highest quality and safety standards required.